I have been working with Indigenous literature on research methods and ethics for over a year now: reading, annotating, thinking, re-reading, and writing from this literature alongside Euro-Western literature on the same topics. During this process I have been reflecting on how I should, and how I do, work with Indigenous literature. Working well with any literature requires careful and thorough reading and reflection. Beyond that, though, it seems to me there are some specific requirements for working with Indigenous literature. To begin with, readers need to understand that although the current body of literature is small, it represents a much longer research tradition than that represented by Euro-Western methods/ethics literature. Indigenous researchers around the world, through their oral history, can trace their research tradition back over 40,000 years (Passingan 2013:361; Steere 2013:388-391). By contrast, in Euro-Western terms, anything over 6,000 years old is pre-history. However, there is also a translation problem. Although the first language of some Indigenous people these days may be English, the community and tribal languages of Indigenous peoples worldwide are very different. The complex concepts people develop when talking and thinking about research and its context may not translate directly between a community or tribal language and English, or vice versa. Even when words can be translated, the ideas those words describe may not be fully translatable to people with different world views. For example, some Indigenous peoples regard their ancestors as involved in the research they conduct. This is an unusual concept for most Euro-Western researchers and it is unlikely that we can understand fully what that involvement means to the Indigenous peoples concerned. Then readers need an awareness that translating an oral tradition into writing is a big intellectual and emotional challenge. There is evidence within the Indigenous research literature that some of its authors are ambivalent about writing. For example, Shawn Wilson states that ‘A problem with writing down stories is that it makes it very difficult to change them as we gain new learning and insights.’ (2008:22) He solves this problem in his own work by writing, not in the Euro-Western linear style of introduction, methods, findings etc, but in ‘a more cyclical pattern that introduces ideas or themes, then returns to them at intervals with different levels of understanding’ (ibid:42). He also tries to write relationally, in accordance with Indigenous ethical principles, i.e. to build a relationship between himself as author, his readers, and the ideas he puts forward (ibid:6). With this aim in view, he uses a literary device of addressing his three children in sections of the book. He chose to do this because, unlike his unknown readers, he has an existing relationship with his children which enables him to use a more personal ‘voice’ in writing for them (ibid:9). Wilson’s hope is that these sections, alongside the more conventionally written ones, will help his readers to develop their own relationships with the ideas and themes in his book. It seems to me that Indigenous literature should be worked with in its own ethical terms. Indigenous research ethical principles are not the same as Euro-Western research ethical principles. While they are described differently by different writers, there are four key ethical principles that recur in the Indigenous literature: respect, accountability, relationality and reciprocity. For me, Indigenous literature should be treated with respect, such as by not dismissing concepts that seem unusual or even alien to me, but by giving them full consideration. If I can’t embrace a particular concept myself, at the very least I need to acknowledge and respect its significance for some Indigenous peoples. Accountability comes with putting my name to my writing on these topics, making my views available on my blog and (next year) in a book, and giving anyone the right to comment or reply, whether or not they agree with me. Relationality involves careful reading and thinking and use of the literature, trying to understand the different works and authors in relation to me, and me in relation to them, as well as the relationships between the works and authors themselves. This is very much a work in progress and I hope one day to extend it into actual relationship with individual Indigenous researchers, though whether or not any Indigenous researcher would find value in that remains to be seen. Reciprocity is the principle I find the most difficult when working only with literature. I hope I can achieve this by writing from the Indigenous literature in a way that its authors will value, and in a way that will enable other Euro-Western researchers and scholars to find and learn from that literature as I myself have done. I have been very concerned that working with the literature could be extractive, i.e. taking ideas and concepts and using them for my benefit alone. It is true that the books I write help me to earn a living, but I am not getting rich from them. Nobody pays me while I write, and my income from writing in 2016-17 was around £1,500 (I don’t have the exact figure yet, but will post it when I do). Also, I don’t write niche academic monographs, but textbooks that have proven to be of interest to postgraduate students and academics around the world. I found comfort in direct requests from some Indigenous writers to include their literature in Euro-Western works (Kovach 2009:13,25; Graham Smith in Kovach 2009:88-89; Chilisa 2012:56), and I hope that raising the profile of this literature within the Euro-Western research world will prove to be a positive act. If it backfires in some unforeseen way, on Indigenous individuals and communities who have already borne too much pain, all I will be able to do is acknowledge and own my responsibility for my part in that process, to remain accountable, learn, and do what I can to right any wrongs. This post is a starting point rather than a conclusion. I have figured all this out myself, so I may be on the wrong track. If you are working with, or have an interest in, this body of literature, please contribute your views in the comments. Last week I wrote about challenging the dominance of English in writing for research and academia. That theme is also relevant to this post, though here it’s more about challenging Euro-Western epistemologies and methods than the English language itself. Over the last year I have built a personal library of books about, or relevant to, my investigation of Indigenous research methods and ethics. The point of this, for me, is to bring these methods into my scholarship, alongside creative and conventional methods, as appropriate. The point is not to become an ‘expert’ on Indigenous research; for a white British person, that is not, should not be, an option. At the start of this work, I worried about being extractive, but I found comfort in the words of Margaret Kovach, an Indigenous researcher from Saskatchewan in Canada, who encourages non-Indigenous scholars to help make space for Indigenous methodologies and assess their value on their own terms. This is what I am trying to do. For those who are new to this topic, ‘Indigenous’ denotes the native peoples of colonised lands, such as Aboriginal Australians or Inuit Alaskans, while ‘indigenous’ denotes the native peoples of non-colonised lands. So I am an indigenous Brit who will never be an Indigenous researcher. Some people described as Indigenous are unhappy with the term because they feel that it makes them seem like one homogeneous group, whereas in fact there is tremendous diversity. For example, there are hundreds of tribal and language groupings in Australia alone. However, as it is the term most commonly used in the literature, I’m sticking with it for now. The first book is the foundational Decolonizing Methodologies by Linda Tuhiwai Smith, a Maori researcher from New Zealand. In fact I bought the first edition of this soon after it came out in 1999, the year I began my MSc in Social Research Methods. The second edition came out in 2012. This book shows how research was used as a tool of imperialism to help subjugate colonised peoples through, among other things, complete disregard for Indigenous knowledges and Indigenous peoples’ own research methods. It highlights the value of these knowledges and methods, and calls for research to be linked explicitly with social justice. Shawn Wilson is an Opaskwayak Cree researcher from Canada who has also lived and worked with Indigenous peoples in Alaska and Australia, as well as spending time with Indigenous peoples in New Zealand, Morocco, and elsewhere. His book, Research Is Ceremony: Indigenous Research Methods (2008), is based on his doctoral research and describes a paradigm shared by Indigenous researchers in Canada and Australia. It’s not easy to get hold of; I tracked down a Canadian bookseller who seems to have bought up the last available copies, and I fear it may be going out of print, which would be a great shame as it is readable and insightful. UPDATE: The publisher emailed me in January 2018 to say it’s not out of print (hurrah!) and it is now available through the link above. Margaret Kovach is a Plains Cree and Salteaux researcher from Canada whose Indigenous Methodologies: Characteristics, Conversations, and Contexts came out in 2009. Her book covers epistemologies, methods, and ethics. It is a work of considerable scholarship that is also accessible and full of wisdom. Bagele Chilisa is a Professor at the University of Botswana. Her book Indigenous Research Methodologies (2012) gives an uncompromising and international account of some of the theories, epistemologies, ontologies and methods used by Indigenous researchers. While no book on this subject could be completely comprehensive, Chilisa makes a good job of showing the diversity, as well as some of the commonalities, of Indigenous methodology. Donna Mertens from the US, Fiona Cram from New Zealand, and Bagele Chilisa have edited a collection called Indigenous Pathways into Social Research: Voices of a New Generation (2013). They have contributions from Indigenous researchers from all around the world: Vanuatu, Mexico, Cameroon, Hawai’i, Alaska, Papua New Guinea, and many other countries. These are fascinating accounts, highlighting personal, political, and ethical challenges, and how they have been overcome. They also say a lot about Indigenous methodologies around the world. Also in 2013, Maggie Walter, a trawlwoolway researcher from Tasmania, and Chris Andersen, a Métis researcher from Canada, brought out Indigenous Statistics: A Quantitative Research Methodology. This book demonstrates the pervasiveness of Euro-Western thought in the construction of statistical research, using national censuses for ilustration. It offers a framework for Indigenous quantitative research, nayri kati or ‘good numbers’, which places an Indigenous standpoint at the centre. There is a short video online of Maggie Walter talking about Indigenous quantitative research. Lori Lambert is a Mi’kmaq researcher from north-eastern Canada who has also worked with Indigenous peoples from Montana, US; northern Manitoba, Canada; and Queensland, Australia. Her book, Research for Indigenous Survival: Indigenous Research Methodologies in the Behavioral Sciences, was published in 2014. To the best of my knowledge, this is the first book to position Indigenous methods within a Euro-Western disciplinary category. Like other Canadian writers, such as Wilson and Kovach (above), Lambert includes the voices of people she has worked with alongside her own in her narrative. Another essential text, though not specifically about research methods, is Southern Theory by Australian academic Raewyn Connell (2009). This book is subtitled ‘The global dynamics of knowledge in social science’ and in my view is essential reading for anyone engaging with social theory. During my MSc, I was taught social theory as the preserve of dead white men, and I am sure this is still being taught in many Euro-Western universities today. Connell’s book gives the lie to this approach. This list is not exhaustive; it is just my personal library. One limitation is that I can’t afford expensive books. While I was writing this blog post, I had a message from my friend and colleague Roxanne Persaud, alerting me to Susan Strega and Leslie Brown’s edited collection Research as Resistance: Revisiting Critical, Indigenous, and Anti-Oppressive Practices (2nd edn 2015). I would love to read this book, but even the paperback is over £60 which puts it out of my reach. These books are not comfortable reads for Euro-Western scholars, but they are hugely important. We need to know how research has been, and is, misused by Euro-Western cultures in order to learn how to use it better. Indigenous scholars are extraordinarily generous in their assessment of the potential value of Euro-Western methodologies, even those methodologies that have been instrumental in stealing their lands and their cultures and traumatising generations of their peoples. Yet most Euro-Western researchers either ignore Indigenous research entirely, or conclude that Indigenous peoples must have picked up a few tricks from the colonisers. I’m not sure which is worse. Indigenous research methods pre-date Euro-Western research methods by tens of thousands of years, and there is a great deal that Euro-Western researchers can learn from these approaches. I was interested to check my blog stats and find ou t which were the three top posts of 2015. By far the most popular was my declaration that I will not work for nothing for wealthy institutions such as universities. That was published on 19 May, almost halfway through the year, and has had many more hits than any other post. Perhaps it will contribute to some universities becoming a little less reluctant to pay independent experts properly. Wouldn’t that be nice? The second most popular post was published in June, and called for researchers and academic writers to make reading a priority. This was a useful post for me to revisit, as in amongst my autumnal travels I forgot about the commitment I’d made to read at least one book chapter a day, six days a week. I have been reading, but more sporadically and lumpily, so now I’ve remade that commitment. I was surprised and delighted to find that the third most popular postwas the one from September when I announced my new venture into indie publishing, and launched my first self-published e-book, Starting Your PhD: What You Need To Know. The second in the PhD Knowledge series, Gathering Data For Your PhD: An Introduction, was published in November, and I’ve now written the third, Analysing Data For Your PhD: An Introduction. That is with my editor and due for publication in January. My brand-new publishing company, Know More Publishing, has already had three enquiries from other writers who want to publish with us, and that was something I did not expect at all. There’s a fourth post, from the very start of the year, on how to write a killer conference abstract. That was the most popular post from last January but only received a tenth of the hits of the top post overall. However, this post probably outstrips all the others, because it was picked up and reposted on the LSE Impact Blog. Of course I can’t be sure, because I don’t have access to their stats, but through the year I have seen this post being retweeted more than any of my others, right up to and including last week. So I suspect this one may be the real big hitter. Beyond the blog, 2015 has been a terrific year for me. Highlights included the publication of Creative Research Methods for the Social Sciences: A Practical Guide in April; the creative research methods conference at the British Library in May; working in Calgary, Canada, in October; and being made a Fellow of the Academy of Social Sciences in the same month. It’s also been a rather tiring year, so this blog and I are going to have a little rest, now, till the New Year. I’m excited for 2016 as I have lots of plans. I’ll be publishing the next four e-books in the PhD Knowledge series, convening a session on ‘research for social justice: moving ethics forward’ at the Research Methods Festival in July, collaborating on special issues and e-books, teaching, speaking, and doing research. And I’m sure lots of other fun and interesting things will happen that I have no idea about as yet. I love my life! I loved my writing retreat over the last two weeks, but it’s left me feeling a bit unbalanced. No, not like that! Let me explain. All writing and no reading has left me feeling as if I need to follow up my writing retreat with a reading retreat. I love reading as much as I love writing. I’ve been reading intensively about creative research methods for the last couple of years, and now there’s lots of other research-related reading I want to do. But why can it be so hard to find the time? I think it’s partly because reading isn’t seen as ‘doing something’, particularly by managers. Practitioners who I interviewed for my first research methods book gave varying reports of this. Some said their managers did value reading and would recommend journal articles they thought would be helpful for staff. Others said their managers did not value reading, particularly where staff had a busy caseload. Yet how can practice be evidence-based if staff and managers don’t have time to read the evidence? Never having been an academic, I naively thought that this would be different in academia: that all academics would understand the importance of reading, and the act of reading would be valued as an essential part of an academic’s work. Sadly, I now know that this is not the case – or, at least, not everywhere. I had an interesting discussion on Twitter last week with Inger Mewburn (aka @thesiswhisperer) and Annika Coughlin about why reading isn’t regarded as work in the same way as writing. (Inger pointed out there was a blog post in that, so here it is – part one, at least; she has promised to write a follow-up.) Maybe one reason is that reading is something you can do anywhere: on a sun lounger, during your commute, in the bath, on a plane. It’s portable, a time-filler, and that makes it seem like a leisure activity rather than work. I think perhaps another reason is that reading is hard to quantify. You can say ‘I’ve read this article today’, but have you read every word? Did you understand it all? How much can you remember? I’m sure we’re all familiar with the phenomenon of reading something and retaining nothing, even straight after we’ve finished. The number of books or articles you’ve read is irrelevant if you didn’t understand or retain much of their contents. On the other hand, writing is very quantifiable, even if none of the 500 words you’ve just written will make it into your final draft. Like writing, though, reading helps us think, and learn, and understand the world around us. Writing, thinking, and reading are the three pillars of the researcher’s working life – or they should be. As a researcher and a writer myself, I want people to read and use research and articles and books, because otherwise what’s the point of all my hard work? Some organisational cultures are much better at producing research than using it, which seems to me like a crazy waste of resources. We should use research first, and only produce more research when that’s really needed. But to use research, we have to… guess what? Wait for it… yep, we have to read. We all have to read. Including me. Here’s my current TBR pile – and it’s going to grow bigger, as I’ve just finished an online shopping spree to help me catch up on some topics of interest. I’ve made a commitment to reading at least one chapter a day, six days a week. And I’m not the only person who has been thinking along these lines; yesterday @tseenster of the Research Whisperer posted in a similar vein about her commitment to read at least two journal articles a day. I’ve been wondering for a while why people are so keen on ‘shut up and write’ sessions, yet nobody runs ‘shut up and read’ sessions. And why do we have an #acwri hashtag on Twitter, but not an #acread hashtag? If we, as researchers and writers, can’t make reading a priority, then we can’t expect other people to read our work either. And that would be a sorry state of affairs. So maybe it’s time for us all to start talking about reading, sharing what we read, and generally telling the world that reading is both important and enjoyable. Doing research ethically is not about finding a set of rules to follow or ticking boxes on a form. It’s about learning to think and act in an ethical way. How ethical an action is, or is not, usually depends on its context. Therefore, everything must be thought through as far as possible, because even standard ‘ethical’ actions may not always be right. For example, many researchers regard anonymity as a basic right for participants. However, if your participants have lived under a repressive regime where their voices were silenced, they may feel very upset at the thought of being anonymised, and want any information they provide to be attributed to them using their real names. In such a context, claiming that they must be anonymised because of research ethics would in fact be unethical, because it would cause unnecessary stress to your participants. In my role as ethics lead for the UK’s Social Research Association, I’ve been helping a group of people from the Academy of Social Sciences who have been developing some common ethical principles for social science. This has involved a long and multi-faceted consultation process, during which a number of people spoke in favour of ‘virtue ethics’, or the idea that a good person will be an ethical person. I fundamentally disagree with this position. As demonstrated in my last post, we are all subject to cultural conditioning which is bound to influence us as researchers. We are also all vulnerable to cognitive biases such as confirmation bias (giving more weight to views or phenomena that support what we already believe) and hindsight bias (seeing events as having been predictable when they happened). Given this, it doesn’t matter how virtuous we are, we’re not going to be as ethical as we could be if we put some simple steps in place. The first step is to acknowledge, and try to identify, your own cultural conditioning, and to learn about the cognitive biases that may affect you. Although we’re notoriously bad at identifying our own cognitive biases, we are better at spotting other people’s, so if you’re working with others it can be helpful to look out for each other’s biases. Then articulate the value base for your research. If you’re working alone, you need to devise this for yourself; if in a team, produce it collectively. And don’t just write a list of words; think through the meanings of the values you choose. For example, if you want your research to be ‘honest’, what does that mean in practice? We all tell lies all the time, even to ourselves, and research is no different. For example, researchers think it’s perfectly OK to lie in the interests of maintaining participant confidentiality. So if you want your research to be honest, you need to consider how honest you think it can actually be. Try to identify your own assumptions. While it’s important to try not to make assumptions about other people, research is usually based on some assumptions, and it helps to act ethically if you know what these are. For example, are you assuming that your research is not intrusive? Or that it will be as high a priority for others as it is for you? Are you assuming that your sample is representative? Or that your data is accurate? Why are you making each assumption? What are the implications of your assumptions for your research? Grounded theorists Strauss and Corbin suggested watching out for absolutes as a useful way to guard against biases and unhelpful assumptions. So if you find yourself, or a participant, using words like ‘never’ or ‘always’, or phrases like ‘couldn’t possibly’ or ‘everyone knows’, take time to work out what is behind the statement. You may well discover an obstructive bias or assumption, and then you can begin to search for a way to counteract that bias or assumption. As social scientists, we try to include a wide range of people as research participants, but we can forget to take the same approach to literature. So another step is, when you’re reading, try to find relevant work by people with different backgrounds and perspectives from yours. This could include people from different nationalities, disciplines, genders, professions, and so on. Then, when you’re writing, try to draw on the work of a wide range of people too – though only if that work is relevant and worth citing, otherwise you are being tokenistic which is not ethical. Economic and Social Research Council (ESRC) Framework for Research Ethics – the ESRC is one of the UK’s biggest research funders, and this Framework was updated in January 2015. The Research Ethics Guidebook – actually a website with a wealth of information, linked to the ESRC principles. Association of Internet Researchers Ethics Guide – a wiki containing useful pointers for doing ethical research online. I wrote a post, a while ago, about the difficulties I experienced in letting go of a piece of writing. I can also find it difficult to let go of reading. One of the things I’ve been doing for #AcWriMo this year is working on an article for an academic journal, about the role carers can play in mental health research. The role service users can play is fairly well established now (which is not the same as it all being plain sailing) but there is clear evidence that service users’ participation will benefit the research itself and everyone involved. There is no such evidence for carers, who are often ignored or sidelined by service providers, researchers, and others, yet I believe that carers also have a unique and valuable role to play in mental health research. According to the literature, so do a few others. I’ve found some articles which are directly relevant, primarily from the Australian region of Victoria, and some others which are peripherally relevant, from various places. I’ve probably found enough. But there’s a niggling anxiety that maybe, just maybe, there’s a crucial, seminal article somewhere which I just haven’t found yet. When I did my PhD, I read from two bodies of literature: work on emotion (huge, over more than a century, no chance whatsoever I could read it all) and partnership (comparatively small, over a decade or two, I could definitely read most of it). That was an interesting experience. I read as much of the partnership literature as I could lay hands on, and a more targeted selection of the emotion literature. One key emotion text was published during my doctoral studies, and I didn’t find out about it until I was close to the end. I read it swiftly, and banged in a few references, but my examiners turned out to be dastardly clever and very much on the ball. They pulled me up for not having considered the writer’s arguments with sufficient care, and made me go back and read and cite her work again. This has left me with a dread of reading inadequately and being found out. And there is so much out there to read! 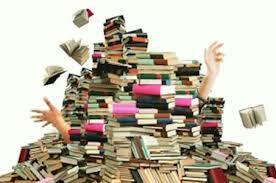 Journal articles, grey literature, chapters, whole books, and more being publ ished every day. I can end up spending hours devising new search terms that might just uncover one more relevant piece of text. For a journal article it’s not possible to review all the literature, as you might for a doctoral thesis. But reviewers and editors will expect a writer to have a good understanding of the literature in the field, and to be as familiar with recent developments as with the seminal pieces of work. And that’s my guideline. Do I have a good understanding of the literature, which includes recent developments as well as key texts from longer ago? If the answer is ‘yes, I think so’, then I can stop reading. While I may still have missed something relevant, it’s over to the reviewers, then, to point that out. And after all, if I carry on reading for ever, I’ll never get any writing done, and what use would that be?